What a strange mess of a movie. If it had been just a little bit worse, it would have been more enjoyable—never quite good enough to be immersively entertaining, never quite bad enough that you can laugh at it. Really the film's only strong feature is Tom Hardy, an unusually vulnerable Eddie Brock. Hardy plays up the character's slight dopiness rather than focusing on the tough guy that you can tell even this film thinks he is at times, keeping a strangely amiable, roll-with it attitude even as things get pretty bonkers. But what a mess of a film. Pacing is all but nonexistent, with the alien symbiote visibly tentacle-possessing people within the first minute or two. 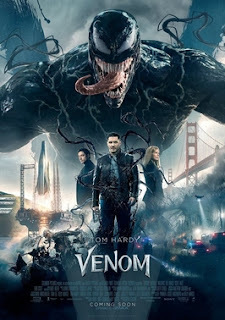 It wants to be a shockingly violent movie, but is incapable of achieving that within the bounds of a PG-13 rating; it wants to capture the character Venom's gross-out cannibal comedy allure, but doesn't know how to achieve that beyond a few hard-to-hear voiceover lines; and most of all it wants to transform a monster we've barely had a chance to meet into an anti-hero we're rooting for, and fails quite remarkably. Venom's "change of heart" is the moment that this film really falls apart: not only is there no plot or visible development leading to this massive 180 in the character, but it's literally just stated, flat out, in a voiceover, "I will save this planet rather than destroy it"—incredibly easy to miss, and never explained or justified. The film's biggest issue, though, is how it can't find a genre or mode to commit to: it clearly thinks of itself as a superhero film, from the formulaic fight and chase scenes to the unusually blatant Stan Lee appearance. But it's also (thanks to the bizarre world of intellectual property rights) totally separate from the Marvel universe, even the Spider-Man-centric stories Sony has already told. This makes the entire superhero tone feel out of place—if we're not in a universe filled with all kinds of supernatural or fantastic beings, then the events of this film should be taking on a kind of gravity that none of these characters seem to feel. 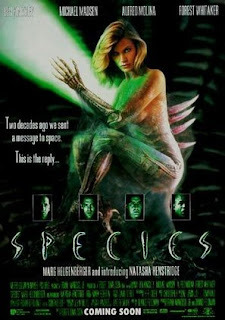 Divorced from Spider-Man, in essence, Venom should be a creature-feature sci-fi flick, something more on the order of Species, but the creators of the film clearly can’t escape the notion that they’re doing an MCU film. You can see a bit of Carpenter-y, Cronenberg-y influence in some of the symbiote design, but the horror elements, which could have been a strength, are quickly washed out by the cartoonishly obvious CGI. Once Venom manifests visually, the film loses almost all of its effectively unsettling alien-ness: Venom comes across as remarkably unreal, weightless and dry, and the animators' obsession with showing the Brock-to-Venom transformation only underscores this. Part of the horror of the idea of Venom in the Spider-Man storyline is that it’s not just a suit—it penetrates, transforms, merges with the host—so visually portraying Brock as essentially a hapless passenger misses the point. The film’s fixation on half-revealing Brock’s face—so it can’t be him biting people’s heads off, see?—sacrifices something horrific for a neat visual gag. Fairly fun to watch in an empty-carb kinda way, and it’s nice to see that the villain, Carlton Drake (Riz Ahmed) is a joking-not-joking-tho swipe at Elon Musk types, but I walked out of the theater reflecting more on the vagaries and limitations of the entertainment-industrial complex than anything else. Also, glad to see her, but their underuse of Jenny Slate verges on criminal.